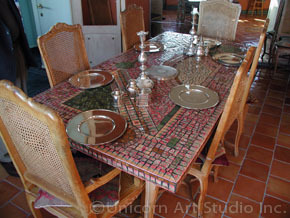 The studio produces custom furniture mosaics and object mosaics for interiors and exteriors. 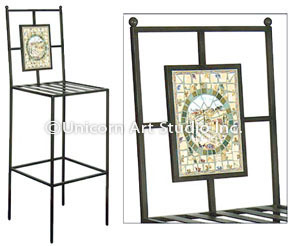 The studio artists work directly with clients or work and collaborate with architects, interior designers and decorators to produce custom mosaic furniture pieces and site-specific mosaics for their client needs. Furniture mosaics include following and much more: dining, console, side, coffee tables, outdoor tables, dining sets with mosaic table and mosaic chairs for interiors and exteriors, backsplash panels for bars and kitchens, mirror frames, armoires and dressers. 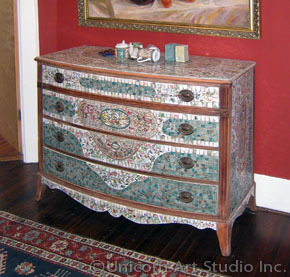 Furniture pieces could be custom designed and built or could be existing new or antique pieces. 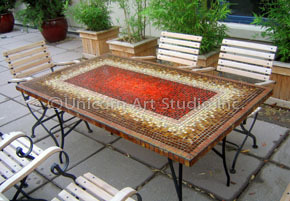 These custom-made mosaic tables are created from durable materials and are great for outdoor spaces like verandas, patios, decks, pools or balconies. Click on image or link to see more. 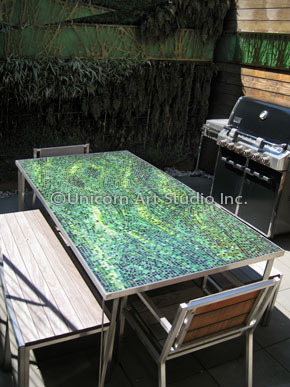 To commission a custom furniture or object mosaic just give us a call or e-mail us. If you need specific colors, shapes, or styles, you are welcome to send us your references. 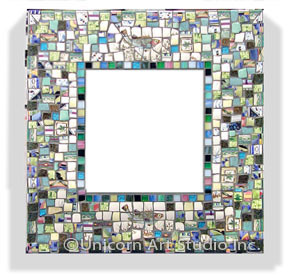 Ready-made mosaics are available for sale from the studios furniture mosaics gallery.